We are making the chili bar of our dreams today! Without sounding like a brat, I’m sort of the self-proclaimed queen of the chili bar. I LOVE making chili bars. I made one for Max’s first birthday party. We made one for Halloween that year too. 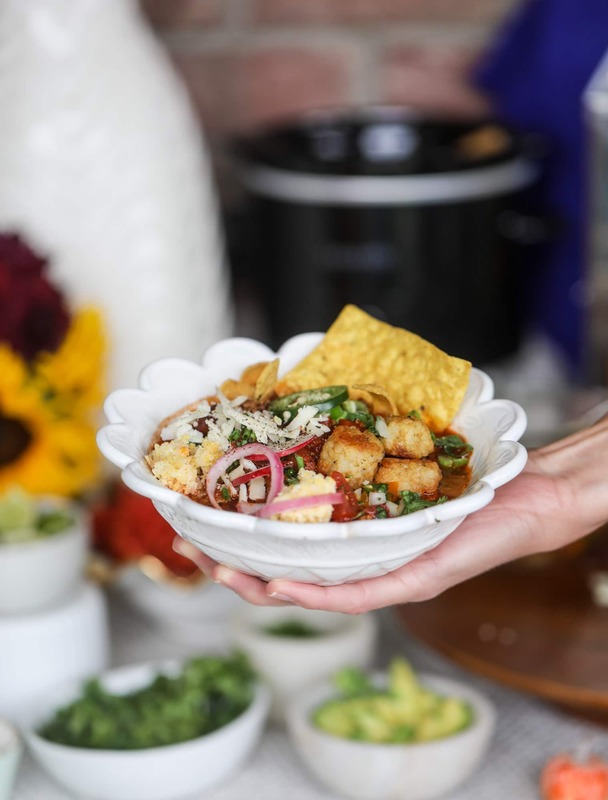 I have a chili bar menu in my book and I am absolutely obsessed because they are the BEST idea for a party. YOU BARELY HAVE TO MAKE A THING! Okay, that’s kind of a lie. A bit dramatic. You have to make the chili. However, you don’t have to make it that day. Or even the day before. My goal when it comes to a chili bar is making and freezing the chili ahead of time (or even making it the night before in the slow cooker) and just prepping my toppings and possible sides the morning of. Just some chopping and throwing ingredients in bowls and you’re GOOD. Unless you want to do cornbread or something wild, it’s not a ton of hands on work. Or should I say: it seems like a lot of work to your guests, but it’s actually sort of easy if you prep ahead. Since having kids, my life has changed drastically and I have to prep all the things. It’s the key to success. I have an amazing holiday guide coming for you soon just on this topic! But back to the chili bar. I might have put flaming hot cheetos and tater tots in my favorite MacKenzie-Childs bowls so you know that this is going to be good. A few years ago on Halloween, I had the chili bar all set up and ready to go. Then Lacy showed up with hot dogs and buns and changed the game. I mean, what a fabulous idea! If someone doesn’t want a bowl of chili, they can make a chili dog with all the insane toppings. Then we have the tater tots. I told you earlier this week that we’d be walking down tater tot lane and boy are we ever. You can make chili cheese totchos or top your bowl of chili with a tater tot or two! If you’re really feeling adventurous, you could bake some russet or sweet potatoes and give the option for stuffed potatoes. I think that is an amazing idea too. I like to do two chilis. Sometimes it’s a red and a white version. Sometimes it’s a beef and a chicken version. Sometimes is a bean and a nonbean version. Sometimes it’s a meaty and a vegan version! People like options. You can make both chilis ahead of time, even prepare one for dinner one night the week before and have a bowl before freezing the rest. Of course, you can always do just one chili too. 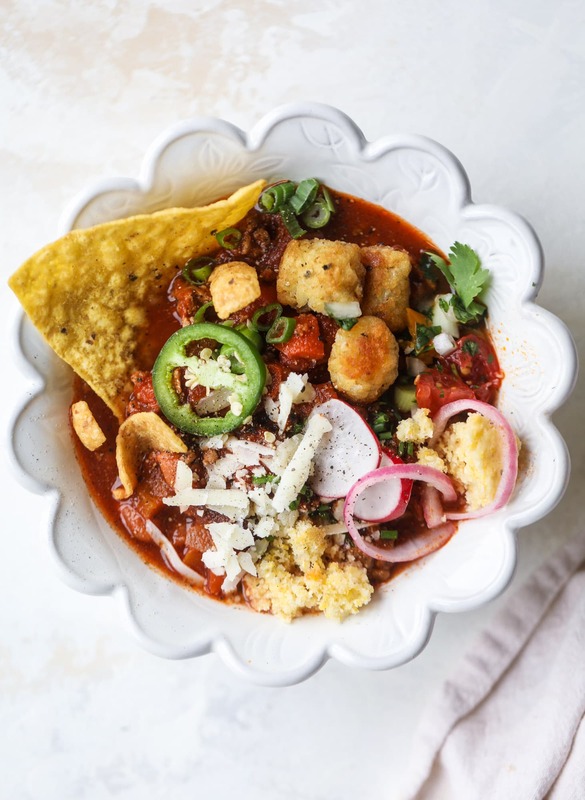 If you’re not having a huge party, one slow cooker full of chili should suffice. My chili recipes here in the photo? One is the white chicken roasted corn chili from The Pretty Dish! I made the entire thing in the slow cooker and just used rotisserie chicken. The other one is a brand new chili recipe that I LOVE and will be sharing on Monday. OMG, just wait. It’s so insanely delicious. I’m including a straight up OBNOXIOUS list of chili toppings and accessories for you to party with. You obviously don’t have to use all of them. But I wanted to make a huge list of everything I’ve ever set out for a chili bar, so you can pick and choose what you’d like. Biggest takeaway: don’t forget the cheese. Melty queso is life. cornbread I have multiple versions in The Pretty Dish! Whether you're doing one chili or multiples, I suggest making them a few days ahead of time and freezing them. The night before, stick the containers in the fridge and the morning of, dump it in the slow cooker! Another option is to make the chili the night before and let it cook all night. The night before, you can also chop a lot of your ingredients and grate you cheeses, place them in small ziplock bags or bowls covered with plastic wrap and store them in the fridge. If you go the queso right, I suggest getting one of the smaller slow cookers or using a fondue pot to keep it hot! I find the slow cooker option works best. Right before your party, assemble your toppings. If you're have a ton of guests, I suggest using heavy duty disposable bowls! Put everyone out on a table, starting with the chili so people can move through a chili assembly line. It's perfect! I always place the chips and the hot dogs near the chili too. Now you’re all set until Spring! This has definitely inspired me to make a chili bar! LOVE this idea! Totally doing this for my little guys 1st birthday in December. thanks rebecca! it’s always such a hit and SO easy. You’re not a brat at all! 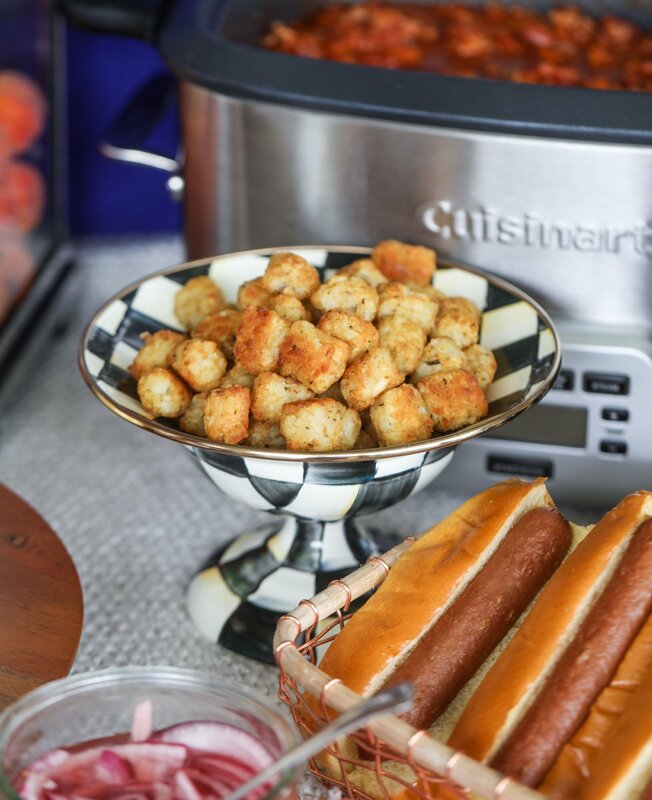 I love this chili bar idea – and cheese is NEVER optional. Hi- would you please post the recipe for the roasted corn chicken chili? I don’t think it’s right that when I click on it, I have to buy your book! hi marisa!! the recipe is in The Pretty Dish! That’s what I mean– please read my comment again. i won’t be sharing the recipe for the white chicken chili on the blog at this time for a couple reasons – i’ve shared the limit of the recipes I can from The Pretty Dish on my blog (according to my publisher copyright reasons, it’s not just up to me) and i love that the book has 200 recipes that aren’t on the blog. you can use any white chicken chili recipe you’d like, of course! you don’t have to use the one in TPD. hi florence! thanks for the comment. so i post 4 to 5 brand new recipes on my blog every single week. that’s at least 20 brand new recipes per month. i very rarely (like, maybe 2 times since march? ), have featured a recipe here that can only be found in my book. this is a business for me, so selling my cookbooks is part of that business. i’ve worked so hard on them and i love to show sneak peeks of what is inside. also, if you notice the title of this post, this is not a recipe post! i am not featuring any specific recipe. this is a method of how i set up a chili bar. any recipes can be used. any toppings can be used! i realize i’m coming across defensive about this, however i cannot imagine going into someone’s business, or even going to someone’s blog, and suggesting that i should receive something for free when i’m already given so much content for free. i work extremely hard to put out 4+ brand new recipes every single week for my readers. if i’m not showcasing some of the recipes in the book, why would anyone have an interest in purchasing it? Hi Marisa – if you’re wavering whether or not you should buy the book – do it! I have loads of cookbooks that I haven’t necessarily gotten good value out of, but this book is NOT one of them! All the recipes are fabulous, and I can honestly say that I’ll be making most if not all of them!!! I agree – The Pretty Dish is a fabulous book – one of my new favorites and you will love having the hard copy of this one – recipes and photos are amazing!! thank you so so much sharla!! that means so much to me! 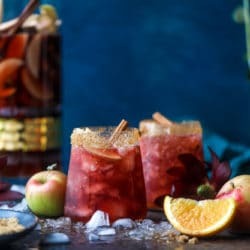 Jessica, I love these party-guide posts that you’re doing and I’m so looking forward to the holiday one! Also, “tater tot lane” -LOL. thanks so much!! i love doing them too! Tater tots as a topping?! Game changer, I need to try that! I usually stick with cornbread or biscuits but after seeing your post I need to branch out! thanks kristen!! i agree, i adore the tater tot! STOP IT. That sign. I am forever stealing that and will give you credit anytime someone tells me how adorable it is. Thank you for sharing this, it is the perfect fall party plan!! OH and I’m also buying your book right now because that chicken chili recipe looks amazing and I need it in my life. Thank you again for sharing such an amazing spread! This. Is. Happening . Tater tots?! shut the front door. Why I haven’t I thought of this genius thing? I love doing a white/chicken chili and a more classic beef, but this list of toppings and sides is everything- the idea of having baked potatoes, nachos/totchos, and hot dogs as a change is fantastic. My favorite chili topping is a big scoop of sour cream! I cannot decide between cheese and crunched-up tortilla chips as my favorite topping! I need them both! I really want to have a little winter soirée with a chili bar now. This is a fantastic idea!!! Omg. Obsessed with the idea of adding hot dogs to this set up. Also, Jessica — full support to YOU. I 100% appreciate that all the content you offer on your blog is FREE (and SUPERB at that! ), which is why I have purchased both of your cookbooks and insanely love them both [insert blowing kiss emoji here!] Keep doing exactly what you are doing. So much love! Excellent idea Jessica!! Love it. You have taken the chili bar to a whole new level. Great ideas that I can’t wait to try. I even have a few Mackenzie Child’s pieces that I can use. Thanks so much! Such a great idea!! I may have to throw a party!! Definitely doing this for my little’s 2nd birthday – perfect for an October birthday! love that!! it’s always such a hit! This sounds crazy but you should add coconut as one of your options. It’s delicious. I’ve converted many people. I made the game day beer chili yesterday while we watched the Browns WIN!- so delicious! I used ground bison and added a few cans of chopped hatch chili peppers! My husband is still laughing about the 1.5 cans of Natural Light beer that I added. Cant wait for the leftovers all week! thank you thank you!!! so glad you liked it! I also want to thank you for your AMAZING recipes and all the work you put into them! I have purchased both of your books and I could not be more thrilled to support you with your endeavors. You have the most creative spin on recipes I actually WANT to make – so thank you for that!! I just purchased your book. Mainly to thank you for all the wonderful recipes you have provided for so long without purchase and second- I plan to make them all! I am making the chili bar Sunday and making the fire and ice chili! What a great idea! I am going to attempt this for my adult 30 something birthday! What kind of salad do you think would be a good complement? I am going to make the game day beer chili and then a vegetarian black bean pumpkin chili.